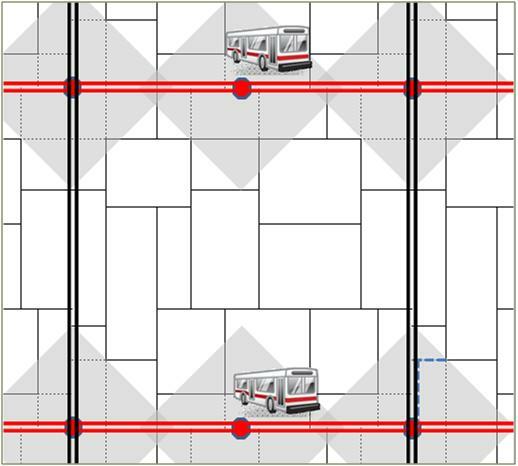 Walking routes to and from bus stops are necessarily constrained by the routes available, which may be along sidewalks or may be along dedicated footways, where these are available. Where possible people will often cut across undeveloped areas to reach a bus stop. However, particularly in fully developed areas, it is rarely possible for riders to travel by “straight-line” to a bus stop. If they were able to do this, the catchment area for each stop would be a circle, as illustrated in Figure 1 above. Assuming a block size of one km with bus routes running along the opposite sides only, this would mean that around 55% of the ground area of each block would be within 300 m. “straight line” distance of a bus stop. Note that the example given shows routes running only “East to West”, and not “North to South”. 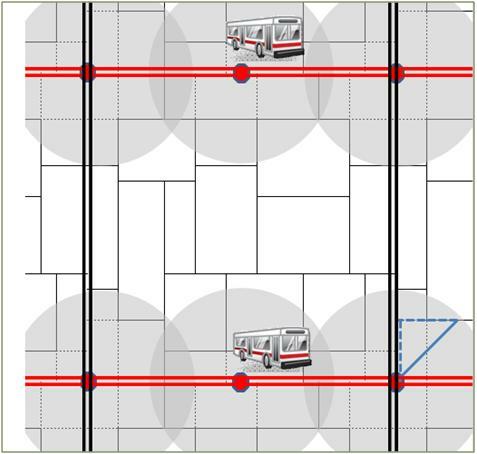 In practice, some blocks may have bus routes running along three or even four sides, rather than just two as shown here – but even if this is the case, the routes are most unlikely to serve the same destinations – it is not just a matter of passengers having a convenient bus stop, but of having the right services from that stop. However, walking in a straight line is seldom an option; the grid pattern of development in many cities usually means that people have to walk around “two sides of a [right-angled] triangle” rather than taking the shortest distance. This can add up to 41% walking distance compared with the straight-line distance; in Figure 1 above, people have to follow the dotted blue lines rather than the solid blue line. Furthermore, if the network of walking routes is coarse, incomplete or irregular, or if a large building or other obstacle lies between the user and the bus stop, walking distances can be further increased. For a one km. square block, these diamond catchments cover 35% of the ground area within a 300m walking distance.